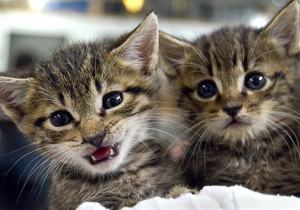 About Us | Sav-R-Cats International, Inc.
Kittens are often found alone and without their mom. Sav-R-Cats International, Inc. was founded in 2002 as a non-profit organization whose primary goal is to ensure the protection, safeguarding and humane treatment of cats. To accomplish that goal, we depend entirely on the contributions of cat lovers and caring individuals and groups – and we invite you to join us. You can become a member of Sav-R-Cats International with a tax-free contribution of as little as $25. 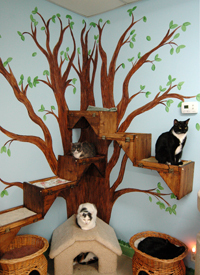 Sav-R-Cats is run by volunteers who care about helping our feline friends. We run an adoption center, located in Surfside Beach, SC, feed and care for numerous feral colonies and practice TNR (trap-neuter-return) for feral cats in the community. We believe in the practice of spaying and neutering cats as soon as they are at the proper weight (and that they are healthy enough) to prevent the birth of unwanted kittens. Together we can make a change! All of our cats are treated with respect and care whether they are ferals living in colonies or are cats waiting for forever homes at our center. Too often, cats are abused, left to fend for themselves and are abandoned. All animals, especially cats, need careful handling, proper diet and tender loving care. Cats that are brought into our shelter must receive the same the treatment and respect as domesticated pets of all kinds. Feral cats, who live in colonies, receive daily feeding from volunteers and loving care every day of the year. We are dedicated to ensuring that all cats are treated humanely and given a chance to live – to brighten a child’s smile and bring companionship and comfort to someone who needs it! We have cats available for adoption at our center and in foster homes and are always in need of volunteers to help at the center, assist with the TNR program and help with fundraising.